Happy Friday!! 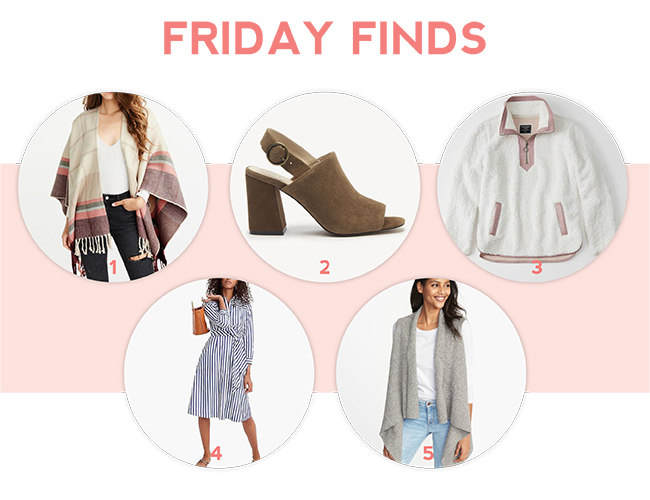 Are you ready for the long weekend? Work has been a little crazy lately so I'm really looking forward to the day off. We are planning on heading out to the suburbs for a family barbecue and also have a fantasy football party and draft. And, in case you didn't see on Instastories, Jeff's little sister was born this week!! Little Isabella is just darling, the perfect little baby. We went to visit her in the hospital, but are hoping to sneak in some more snuggles (and maybe bring lunch for her mom and dad) this weekend. I'll be off on Monday, but am hoping to be back on Tuesday with a full schedule of posts for the week. I managed it this week, could you believe it? Anyway, here are this week's finds! I'm most excited about that pullover! I have last year's version in pink and white though, so I'm thinking if I decide I need another fleece (ahem: I do not.) I'll go for the olive. Ahh my messy room! 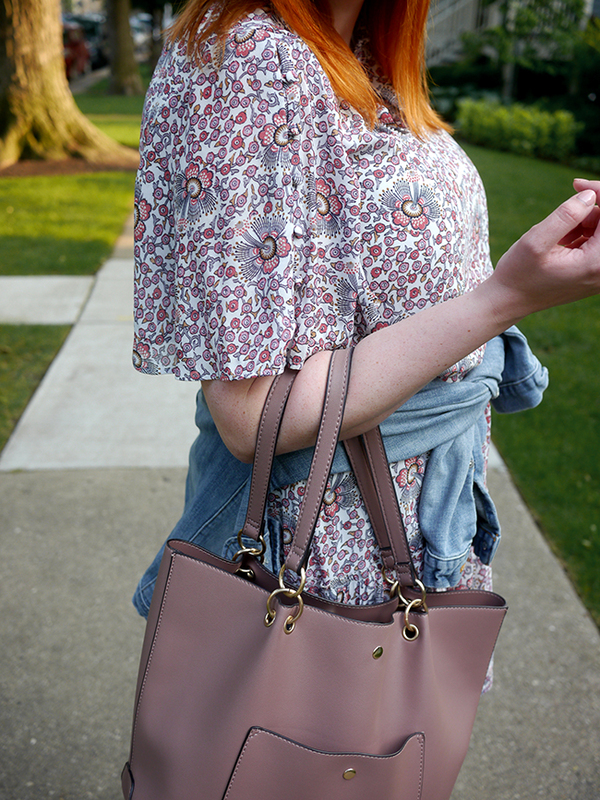 I've been trying so hard to keep it clean this year and I swear it works sometimes - I did manage to get those bags of clothes to Salvation Army this weekend! This dress came in the mail last week and I'm in love, it's so perfect for fall. It's one of those dresses that's somehow flowy but cut really close to the body and flattering still. I also love the length, it's fun for the weekend or dates, but still long enough for work. Just a note, I thought from the pictures that the pattern was a bunch of muted colors, but it's actually just white and yellow flowers. 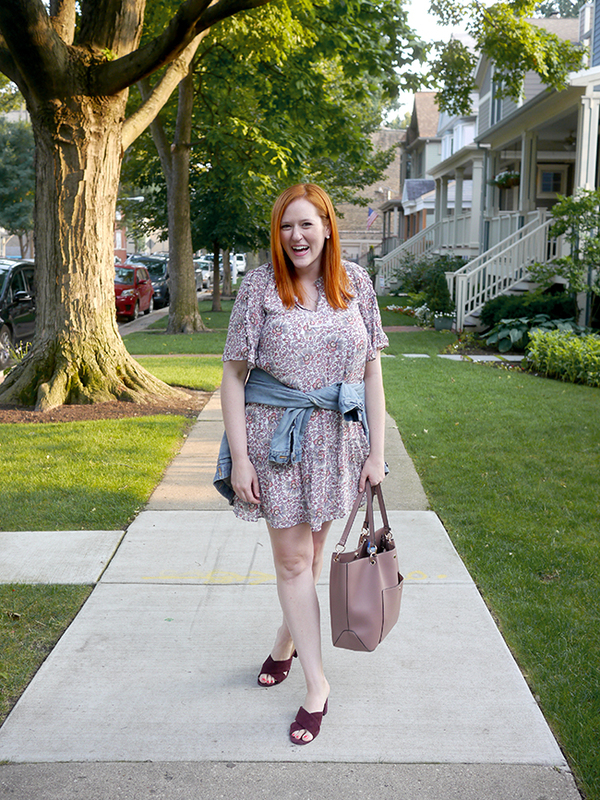 Also here are those sandals again - I also have them in green and love them (and wear them all the time - like here and here), they're amazingly comfortable! 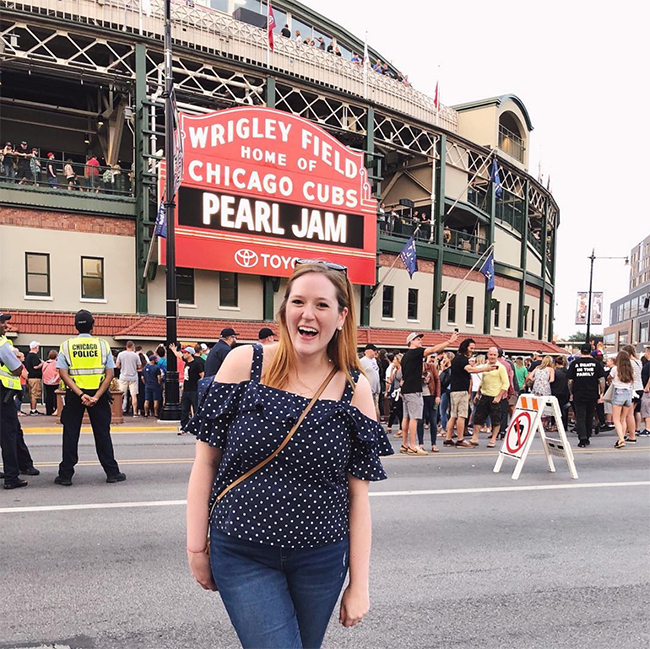 We also went to see Pearl Jam when they were in town! I was excited for the show, but it turns out I know like literally only two of their songs!! Ha, going to blame age for that one? Can I? Also, we got our tickets through a broker and have never had an issue before, but somehow there were people in the stadium with duplicate tickets!! We got to the seats first so we got them, it looked like the other people ended up in standing room only. Not sure how we were both let into the stadium, but that just shows you have to be really careful where you buy your tickets! I've been traveling a lot this summer, including a bunch of trips out to San Francisco for work. They have been having a really cool summer (think low 60s!) 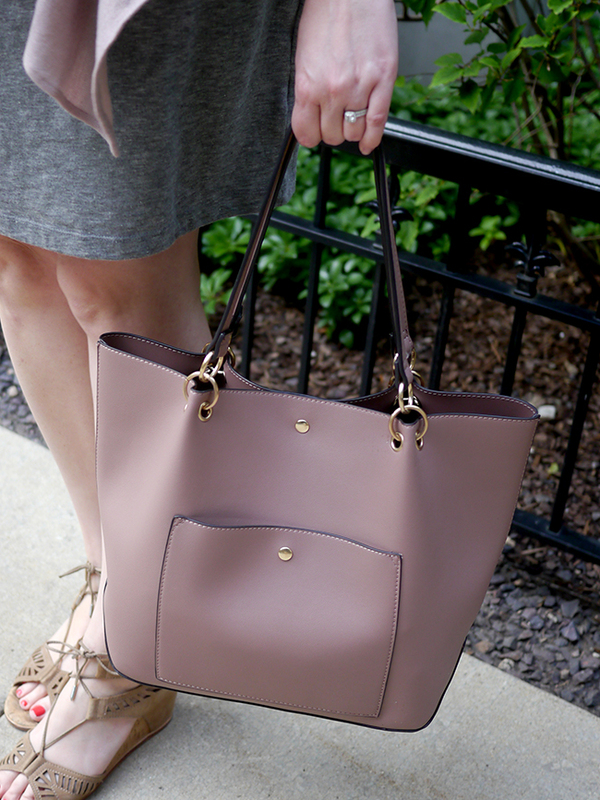 so it was the perfect excuse to break out some of my fall new arrivals. 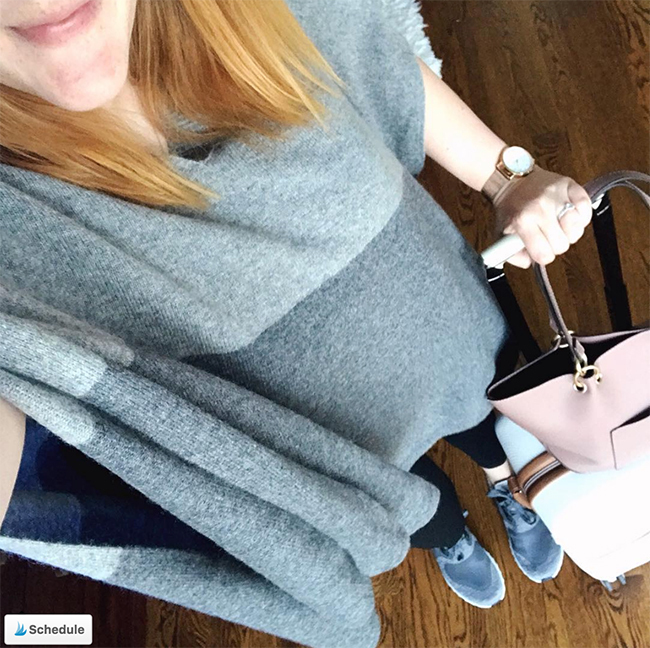 I love this cashmere wrap for the plane because it's so comfortable, and it's easy to pull your arms in if you get chilly or slip it off if the plane gets hot before takeoff. I've been bringing this carry-on everywhere, and it really is perfect - it fits so much inside and keeps me much more organized than usual. Oh, and it's cute too! 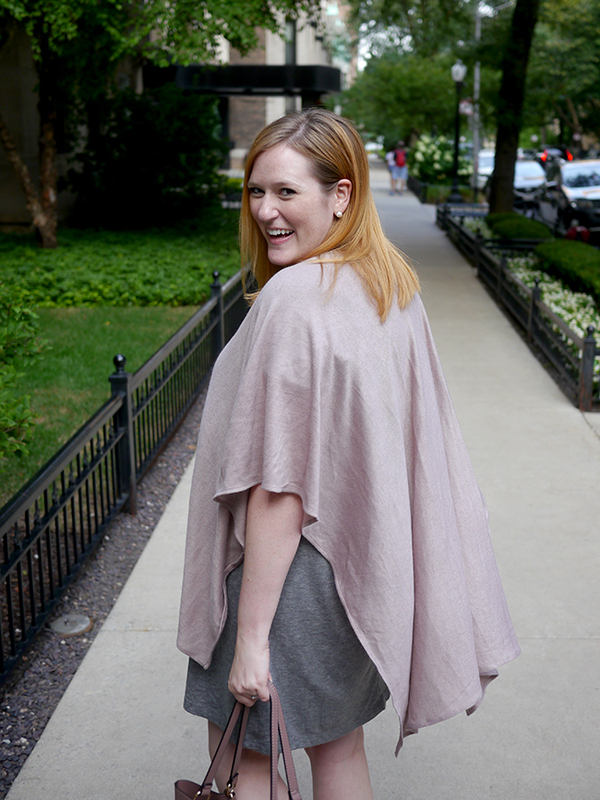 Halogen Cashmere Poncho (available in more colors here) - originally $149, on sale $98.90. I loooooove this piece. Honestly even on sale the price is more than I would normally pay for something like this, but really I'm so glad I did. It's really soft and comfortable, and I've already worn it while traveling. I know I'm going to get a ton of use out of it this fall and winter. Ann Taylor Suede Sandals - originally $128, on sale + used rewards $66.80. I already own these exact heels in green and have been wearing them everywhere this summer, so when I saw this pretty fall red was available I had to snag them. I've already worn them a couple of times, they're so comfortable!! 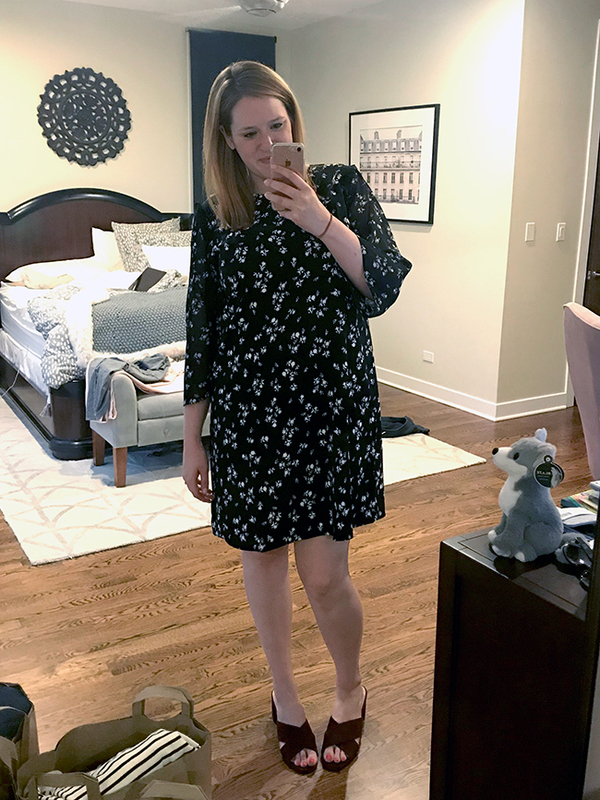 Ann Taylor Floral Dress - originally $139, on sale + used rewards $73.40. This dress is so, so cute in person. 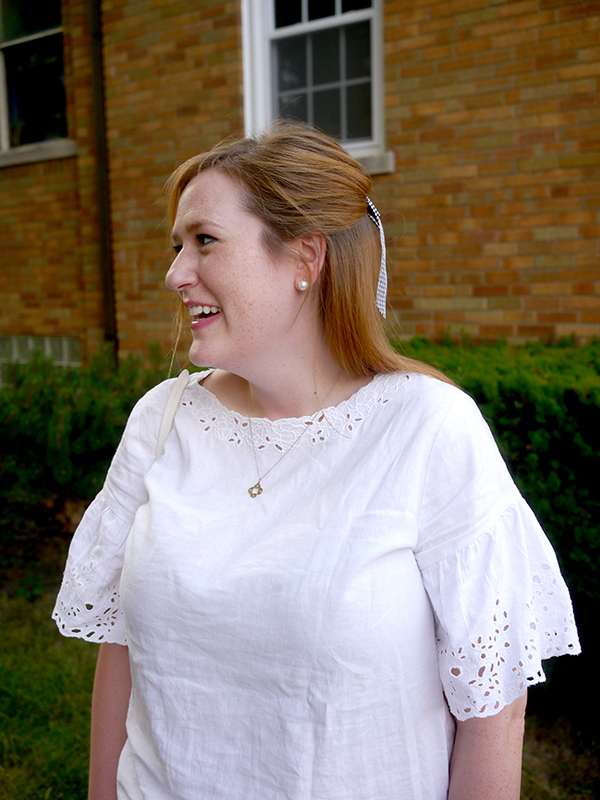 It's an amazing cut that's flowy but still flattering at the same time, and really is the perfect length that works for work or the weekend. Socialite Tie Thermal Tee - $39. I'm still not 100% sure on this tee - I think it just would look better if it were slightly more oversized on me. But I love the concept so much I might keep it anyway. 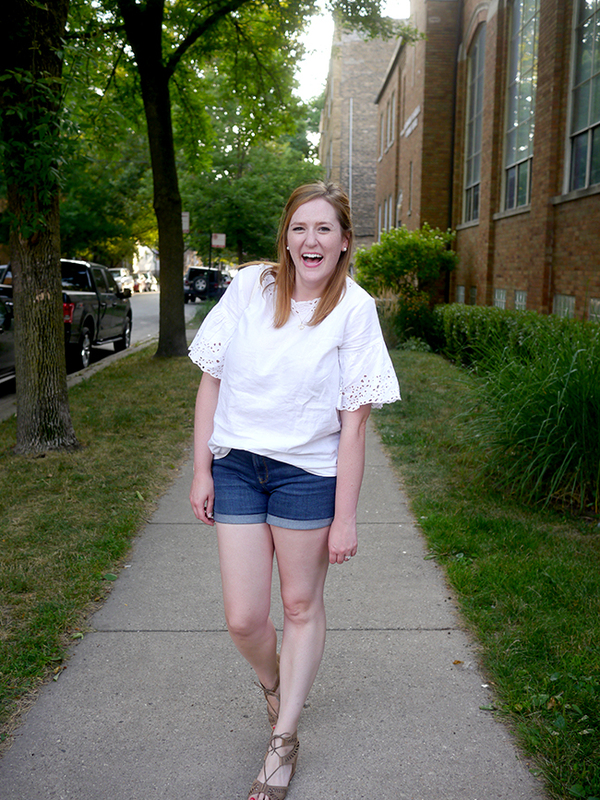 It's fun that it's lightweight and short sleeved, which will be great for transitioning into fall (but will still work with cardigans once the weather cools down). Right now it's sitting in my return pile but I keep trying it on to see if I want to give it a chance. 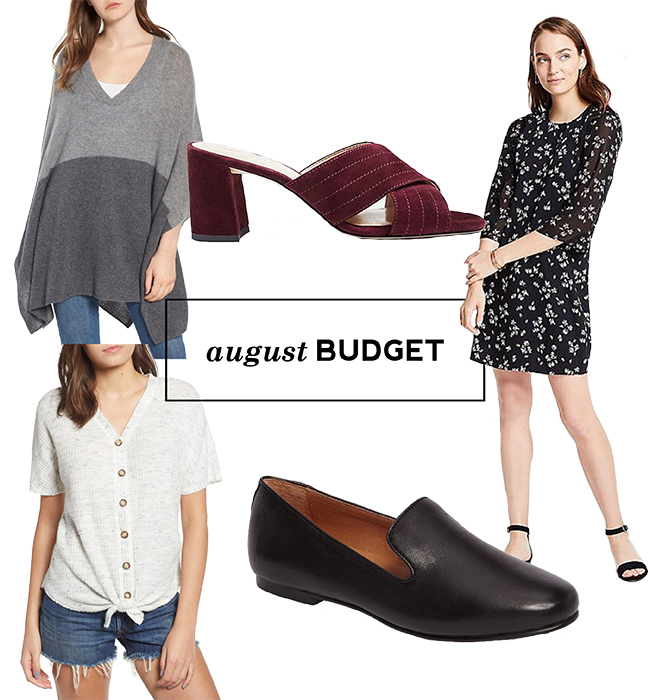 Gentle Souls Loafers (also available in taupe) - originally $149.95, on sale $99.90. In case you've somehow missed it, I have incredibly picky feet. These are basically the comfiest things I've ever put on them between the already broken in heel and the cushioned insoles. They'll be great for my big work conference coming up at the end of September! So, if I do end up returning that thermal tee I'll be right on budget for the month! Maybe I do want to take it back haha ;) I'm really happy with everything else I got this month though, and I'm happy I spent a little more on each item to get some quality pieces for my closet. 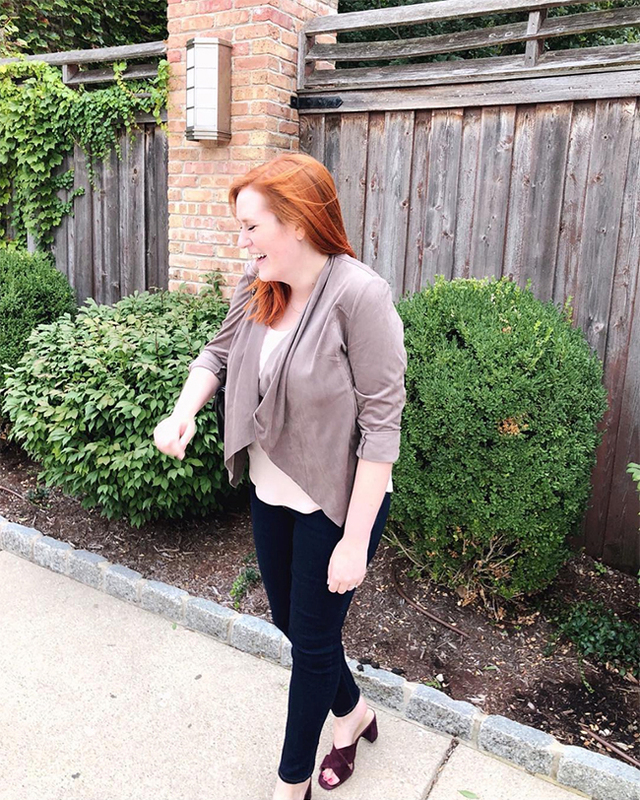 As far as next month goes, I'm looking for a few more transitional pieces to get me through the early part of fall. Jeff and I are homebodies by nature - what can I say, we just really love our couch!! I think honestly if we didn't think about it, we could easily end up spending an entire Saturday inside. So every now and then I put my foot down and force out to explore, especially on a beautiful weekend like we just had. 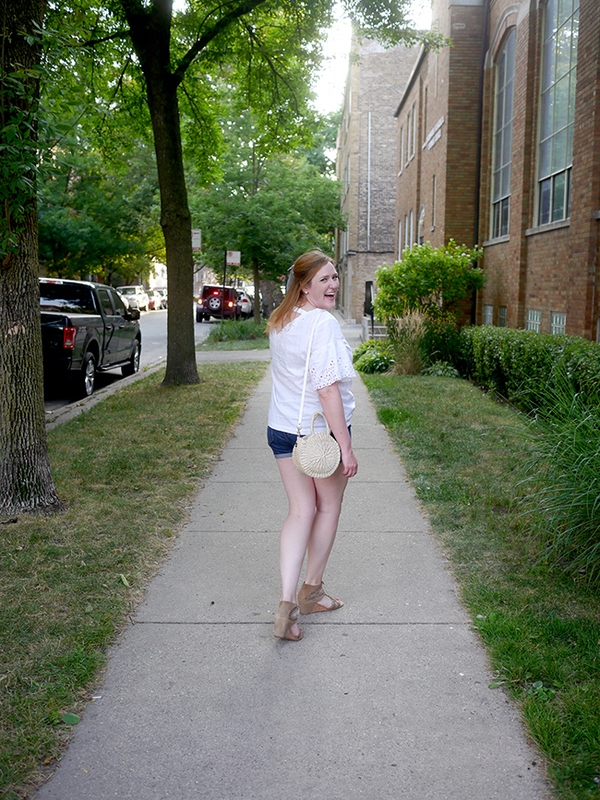 Lincoln Square is really close to our house and is full of some really cute streets that are fun to wander down, and of course tons of restaurants and shops and bars too! 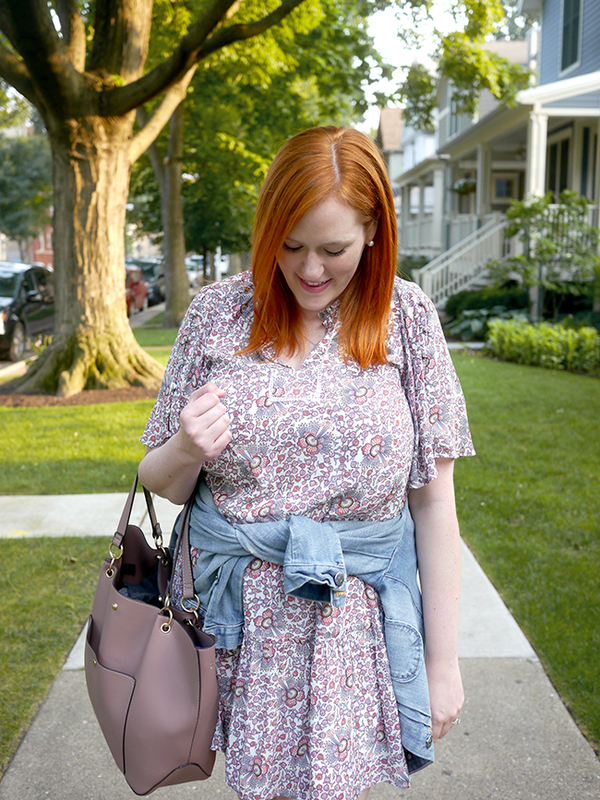 I almost didn't have Jeff snap any pictures while we were out, but I actually chose to share this dress from last summer again because I was in stores a couple weekends ago and saw something incredibly similar on the racks. Like I swear, the same cut with the ruffle at the bottom, and a really similar pattern. Well, lo and behold, I cannot find it anywhere online. Ugh, major blogger fail right there. 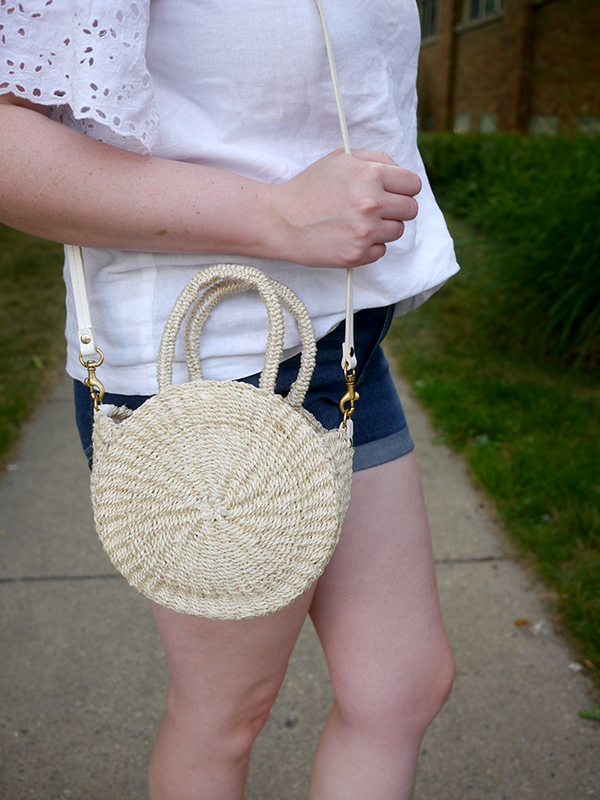 I guess though, it's good to see that I do rewear pieces all the time, even if I'm not sharing them on repeat here! 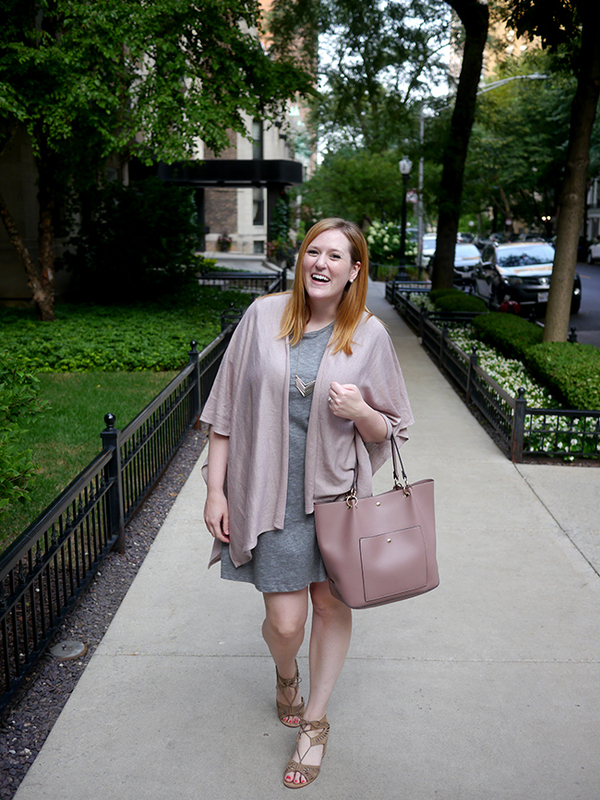 Really, I've been in this dress a ton over the past few weeks since it's so lightweight and breezy, but the palette is a little softer as we start to transition into fall colors. I honestly often struggle between showing you what I'm really wearing every day, and wanting to show you only new stuff so you won't get bored. So tell me - do you prefer to see new items only? 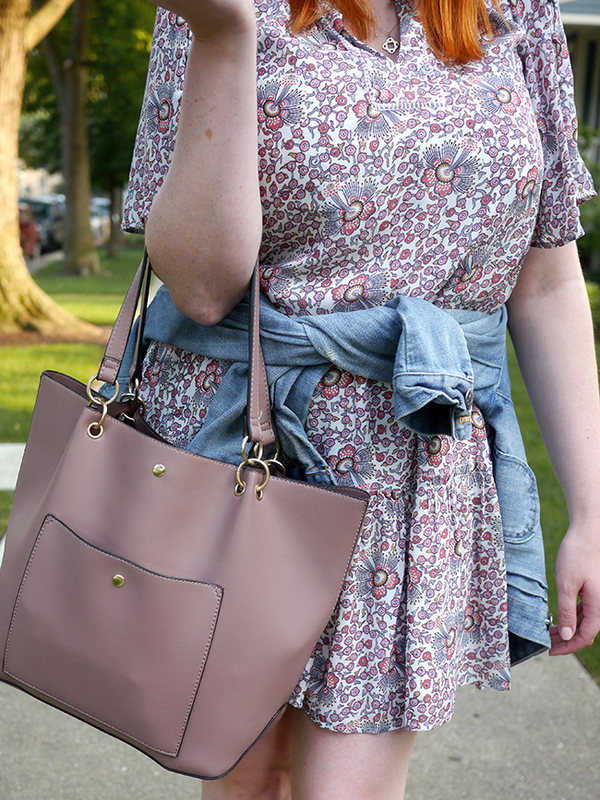 Or do you like seeing how I remix my wardrobe? ...after a couple weekends of doing Jeff oriented activities (sports, action movies, etc), I got Jeff to go see Crazy Rich Asians with me. You guys, it was the perfect romantic comedy. Funny and sweet, but not dumb like so many romantic comedies are, with characters that actually had some depth. I remember skipping the book (honestly the title threw me off, sounded a little trashy) but I think I'll pick it up now and find out what happens in numbers two and three! We went to the movie at 4pm, letting us squeeze in another early bird special at The Grafton afterward (we were weirdly craving heavy Irish food in 90 degree weather), and then home and in our pajamas by 8 haha. ...finally managed to drop a bunch of our stuff off at the Salvation Army and it feels so good to be rid of everything. I've actually never dropped stuff there before (I always was lazy and put old clothes in the donation bins around Chicago but I know they actually aren't the best for donating!) and now that I know how easy it is I have a feeling I'll be there all the time! ...had my parents and sister's family drive out to go to Gene's to hang out on the rooftop and eat sausages with us - one of my favorite things in Chicago in the summer! It was hot, but still so fun to see them. Oh, and in other news, looks like Jeff's baby sister is most likely coming into the world TODAY!!! We're so excited to meet that little girl! You may or may not have noticed I've been posting a lot less around here lately. 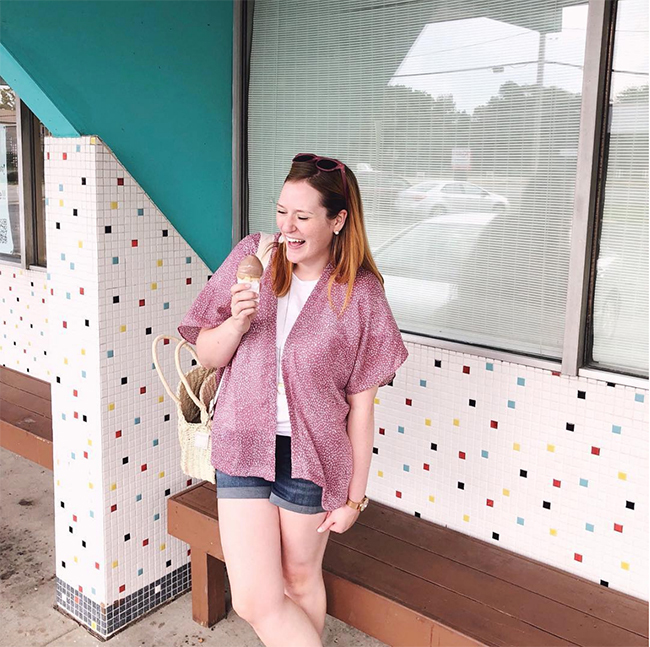 I used to be really strict and would pick a schedule and stick with it - if I said I was posting five days a week, you had better bet there were five posts up! But I'm hitting a few compounding factors at the moment. We're hitting our busy period at work gearing up for our big annual conference, which is leaving me with a lot less free time. We're also in that weird place between seasons, where I don't really have anything new or exciting to show you clothes wise because I haven't been wearing anything new. 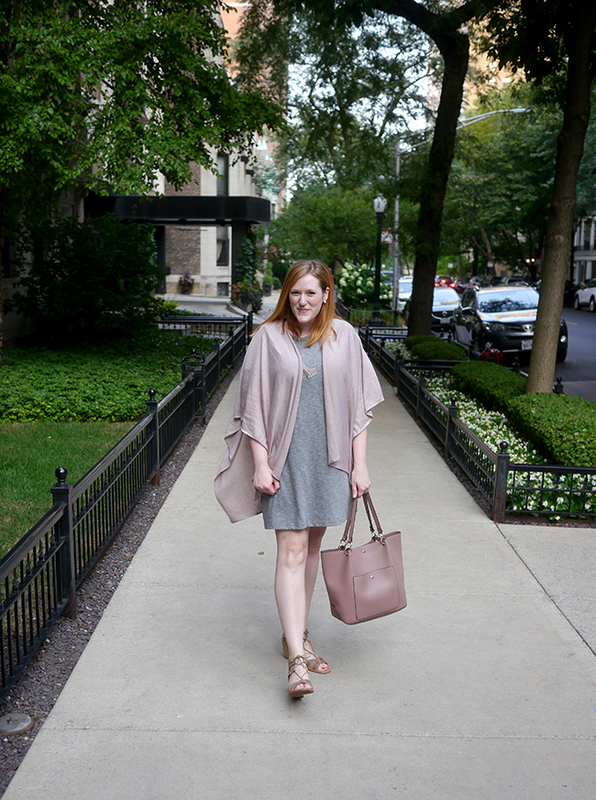 I'm not the kind of blogger that shows outfits I'm not really wearing! And frankly, I've just been feeling a little uninspired. I'm hoping things change as we move into fall - I guess we'll see! Oh, and of course, it doesn't help that there's four hours of Bachelor in Paradise to watch each week ;) Anyone else watching this season? I am very, very amused. So I said I haven't been wearing anything new - technically this dress is new, but I've been wearing it so much (literally several times a week - ha!) that it doesn't feel like it anymore. 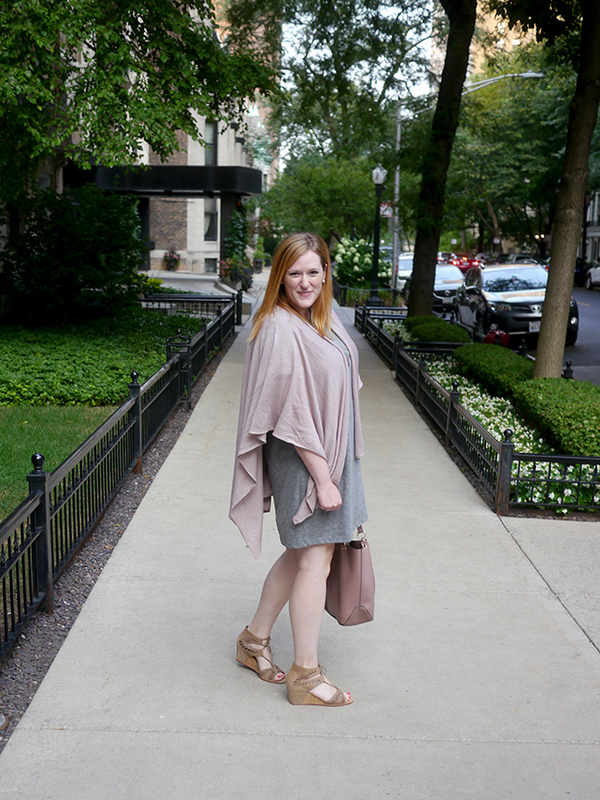 It's seriously so comfortable, weirdly flattering for a swing dress, and really versatile. 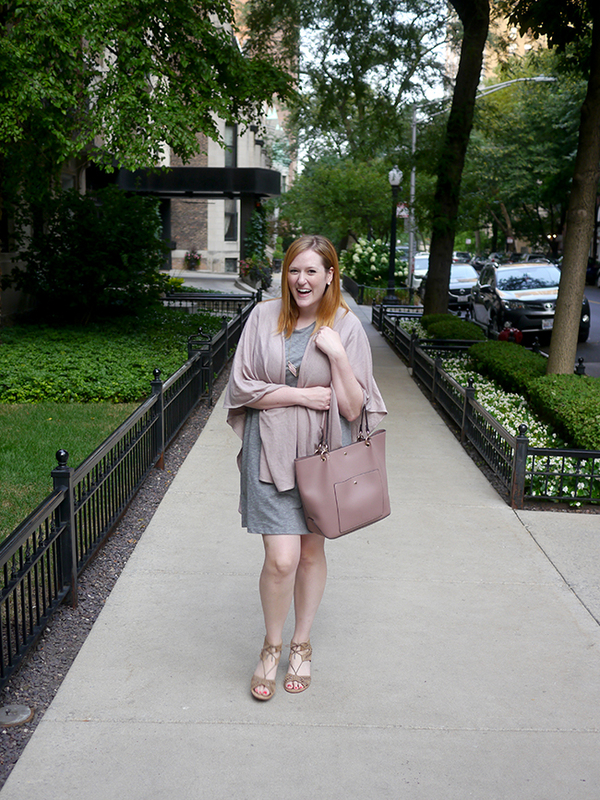 I'm loving it here with this wrap, which makes it still feel summery while ensuring I don't completely freeze in the office. 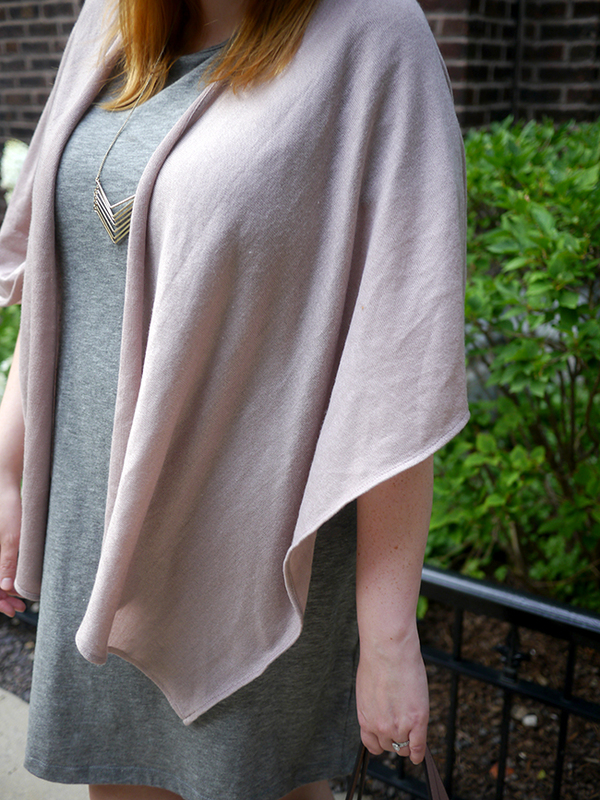 But I've also paired it with longer cardigans, which I think will be so cute when you add in some booties come fall. And I love the idea of it with a blanket scarf for fall too. Like I said, so versatile! In other news, have I told you Jeff is getting a new little sister? Yep, that's right, his dad is having another kid with his new wife - you might remember they got married earlier this year! We're really excited about the new member of the family, who is supposed to arrive in the next week or two. Not many siblings have 33 years between them!! It's kind of funny to think just how old we'll be when she graduates high school or gets married - the old fogeys! We went out to dinner with Jeff's dad and extended family a couple of weeks ago, which was really the last hurrah before the baby comes. His dad just moved to the Gold Coast, so we hit up their new favorite restaurant Nico Osteria. I was telling Jeff I'm definitely not mad about it being their go-to - the food is so good!! I had the lobster spaghetti this last time and it was so freaking good. After dinner we went for a little wander through the neighborhood to look at the pretty pretty (multi-million dollar) houses and snapped these pics. Think we'll win the lottery soon so I can move to Gold Coast?? 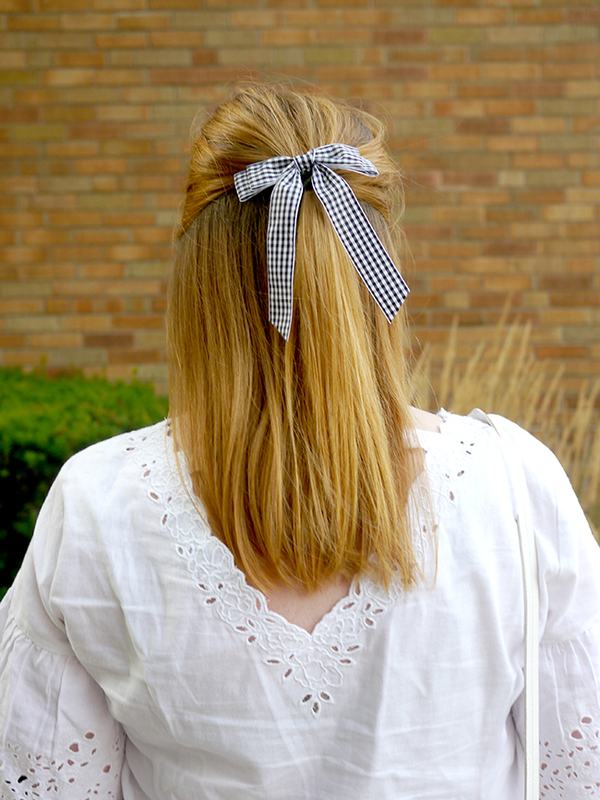 White Eyelet and a Bow! A couple of weekends ago, Jeff and I planned a last-minute dinner date to celebrate some good news we both had in our work lives that week (last minute because my mom texted me asking what we were doing to celebrate, and I was like, oh, duh, we should do something hahaha - thanks Mom!) 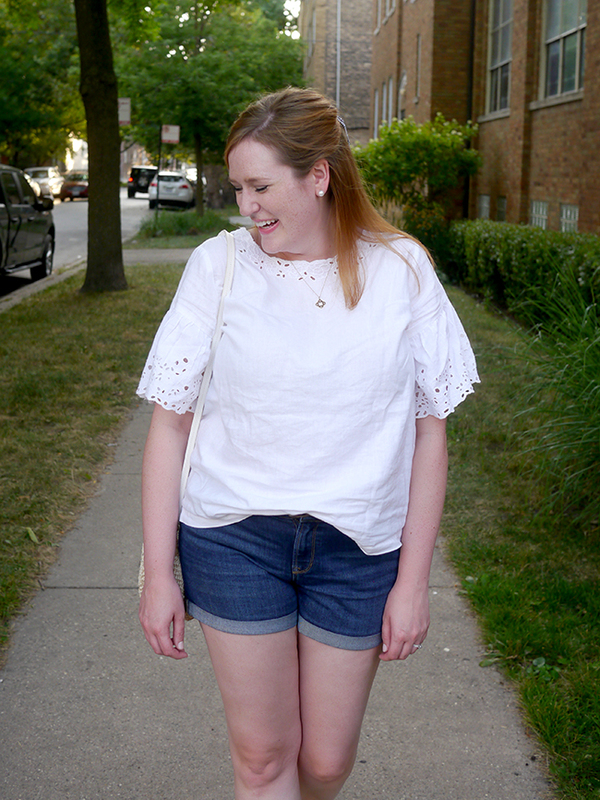 I had grand plans to get dressed up, but then it was about 95 degrees out and I was exhausted from throwing a bridal shower earlier that day, so shorts and a cute top it was! 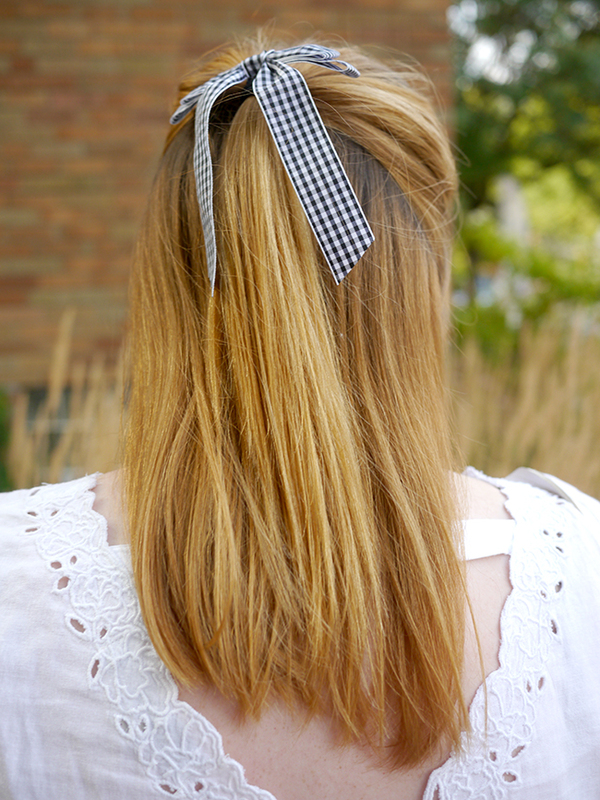 To make the outfit a little more fun, I added in this cute gingham hair bow! Hair bows were huge last winter but took a little pause when all of the velvet and sparkles didn't seem quite right for spring. But with gingham? I'm so back in on this trend. 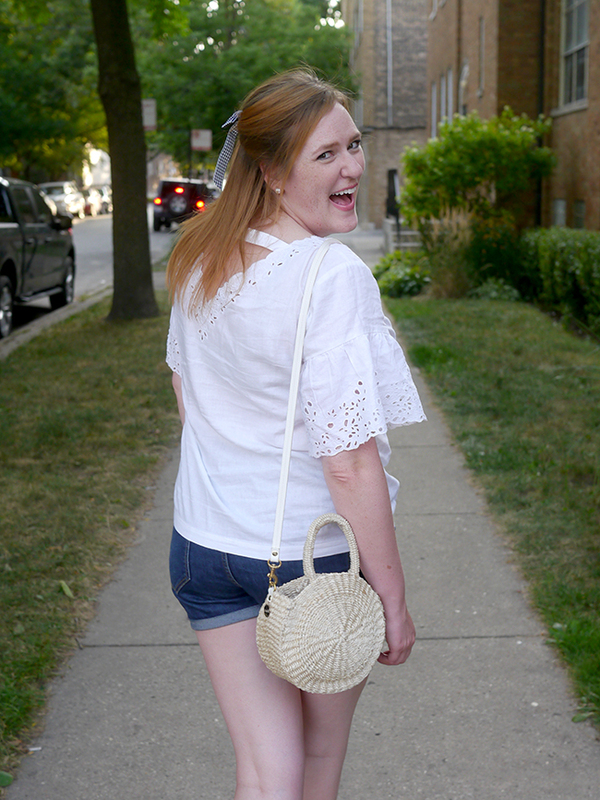 For dinner, we headed to Drawl, a new place in Lincoln Park that is so cute. I don't know about you, but I'm very pro when restaurants think about how to be the most Instagrammable - I mean, just look how cute! It's a fun mix between modern southern and fun vintage stuff you might find in your grandma's house (or is it just my grandma's house that's full of hunting dog paintings and maybe a giant dog statue or two?) - and the food wasn't bad either! We loved the she crab soup and the fried chicken - yum! !